the Elatochori Ski Center is found on the northeast side of the Pieria Mountains, at "Papa's Land", at an altitude of 1450m. Situated in a prime location with spectacular views of Mount Olympus and Aliakmonas river . It is just 8 km. From the picturesque village of Elatochori ,13 km. from the picturesque village Katafygio , 36 km. From Katerini, 474 km. From Athens, 105km from Thessaloniki and 120km from Larissa .. Although it is a relatively new ski resort has been popular with winter sports enthusiasts, who flock to the slopes. Due both to the robust infrastructure of the center and the wonderful nature that surrounds it. Facilities Ski Center include 10 tracks with varying height difference and with different levels of difficulty to satisfy both the experienced and demanding skiers and beginners who first try their potential in the most popular winter sports. It also operates a track for a snowboard and toboggan facilities. 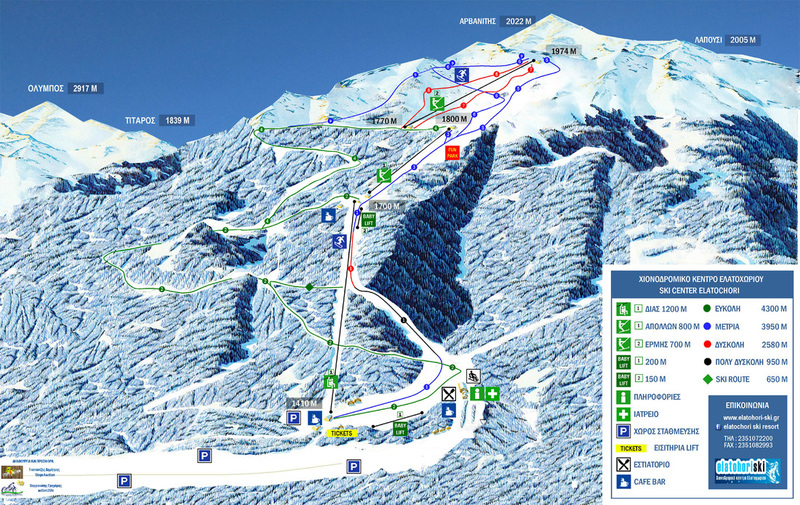 The total length of the runs and have a network of snow-corridors connecting them to each other, exceeding 12,000 m.
At the base of the ski center there is a new level chalet which stands out for its modern design, which blends with the environment. There are also outlets and rental equipment and ski types and ski school. It is worth mentioning that the ski center operates a fully equipped infirmary for first aid with permanent doctor on a daily basis.